West Indies have announced that 14 of the 15 players selected for next month's tour of South Africa have signed their contracts. 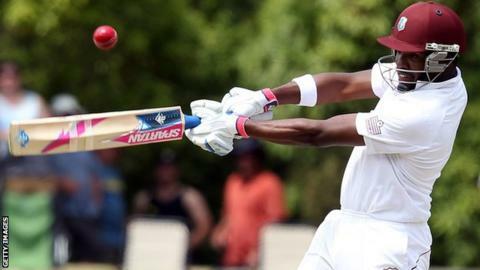 Batsman Darren Bravo asked not to be considered for personal reasons and a replacement will be announced. The Windies pulled out midway through their tour of India in October after a contract dispute with the West Indies Cricket Board (WICB). The players were given until Tuesday to sign their South Africa tour contracts. Apart from Bravo, the Caribbean side will be at full strength with Denesh Ramdin remaining as Test captain while opener Chris Gayle returns after injury. The first of the three Tests starts at Centurion on 17 December, followed by three Twenty20 internationals and five one-day internationals. Bravo's half-brother Dwayne was the captain of the Windies one-day squad which flew home midway through the India tour, with one ODI, one T20 international and three Tests still to be played. West Indies Test squad: Denesh Ramdin (capt & wk), Suileman Benn, Jermaine Blackwood, Kraigg Brathwaite, Shivnarine Chanderpaul, Sheldon Cottrell, Shannon Gabriel, Chris Gayle, Jason Holder, Leon Johnson, Kemar Roach, Marlon Samuels, Jerome Taylor, Chadwick Walton (wk).